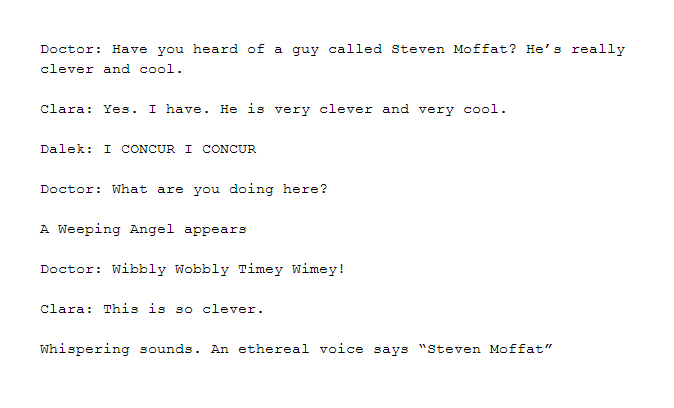 I found a script for Doctor Who. I mean I know I’m not Moff’s biggest fan, but that was an unmitigated pile of shite, yes? Yes. Moffat killed Dr Who for me. I still kinda half watch it, because the kids like it & it’s on, but gone are the days when I used to go “OMG! Doctor Who’s on! Quick! Switch it over!” & would scramble to get everything I needed to sit & watch it avidly. I’m so sad about this. They killed my fandom. Not unmitigated. There were three things I liked – the weeping angels popping up out of the snow like meerkats, the doctor doing the dramatic walking out of an explosion thing while swinging his cane like a silent movie comedian and…um…I liked some of the Papal Mainframe stuff when it wasn’t Tasha licking the Doctor.